Trumpeter is a model company based in Macau China. The NKL-16 was an aerosan introduced by the Soviet Union during WWII, based on the earlier NKL-6. Actually aerosans were around as early as 1910. The NKL-16 was made of plywood, powered by a M-11G aircraft engine. It had a speed of 75 km/h and could carry a crew of up to 4. Armament was a machine gun and personal weapons of the crew. During WWII, improved NKL-16/41 and NKL-16/42 models were built, and production started at the ZIS car factories and at smaller industries such as the Stalingrad Bekietovskly Wood Works. The NKL-16s were organized into transport battalions with NKL-20s. The kit comes in a shrink-wrapped tray and lid type box. 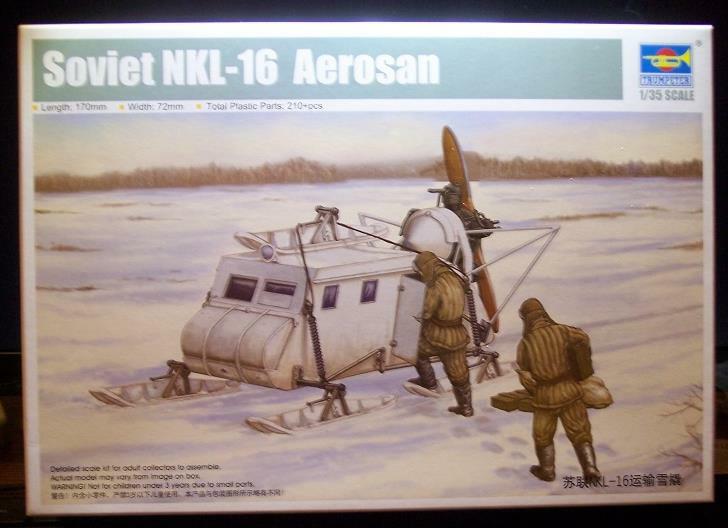 The box art shows a NKL-16 parked in a snow-covered field with 2 crewmen loading supplies into it. One side panel of the box has a one paragraph history of the vehicle next to a color illustration of the NKL-16 as a front and rear view and a illustration of the brass PE fret in the kit. A sticker announces that the kit is distributed by MMD Squadron. 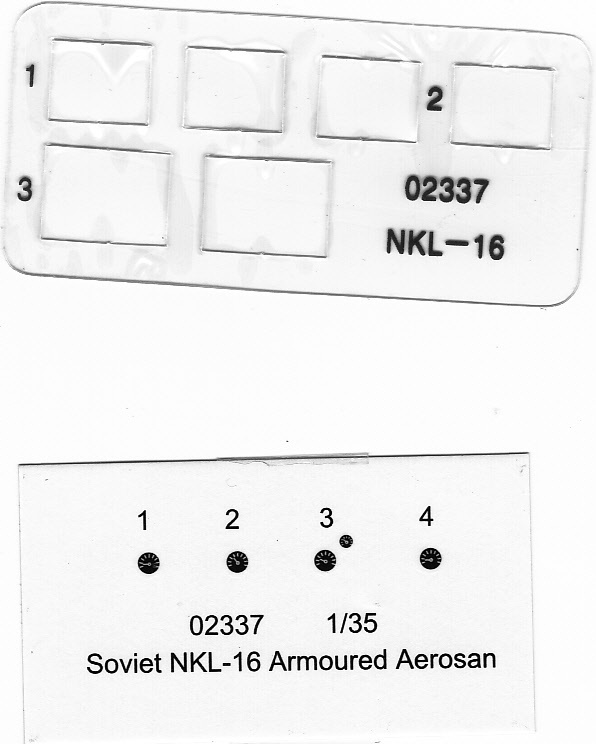 The other side panel of the box has a color illustration of both sides of the NKL-16 next to a statement in multiple languages (including English) that the kit is not a toy and is intended for modelers over 14 years of age. The main kit material is called out as being plastic and the kit is said to be made in China. A copyright date of 2013 is shown above Trumpeter’s street address in Macau and their web site address. Inside the box are 9 light gray parts trees and a single light gray chassis tub part in 7 sealed cello bags. The brass PE fret is in a sealed cello with a sheet of card to prevent bending. A die-cut clear sheet of windows and the decal sheet are in a final sealed cello. The decal sheet has a tissue taped on it that covers the face and prevents scratching of the markings. Very nice packaging. The instructions and a sheet with a 5-view color illustration of the NKL-16 in an over-all white winter scheme is included. This sheet calls out paints from the Mr. Hobby, Velejo, Model Master, Tamiya and Humbrol brands. 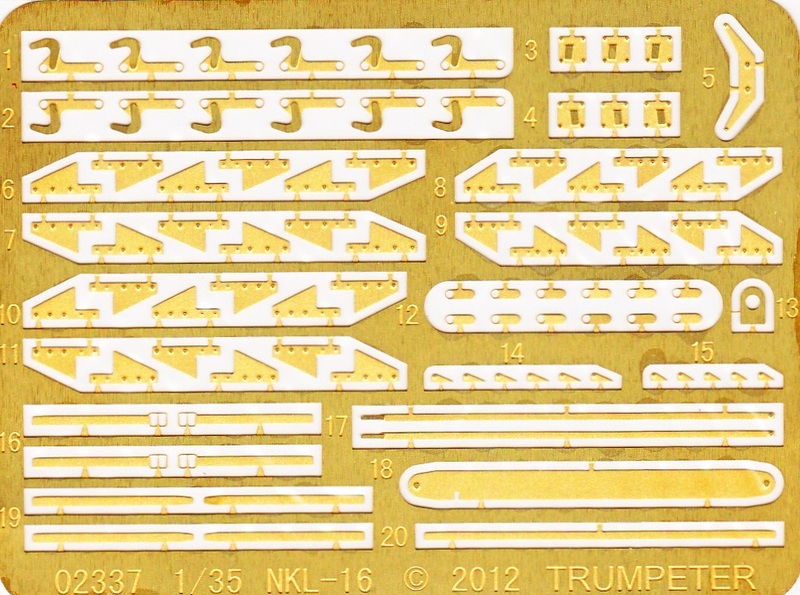 Another full color sheet shows the box arts of 4 other kits that Trumpeter markets (including this NKL-16) with brief histories of these subjects and illustrations of the PE frets that are in the kits. A Mig-23MF Flogger B in 1/48th scale. Kit no. 02854. A Soviet 2S3 152mm Self-propelled Howitzer, Early Version in 1/35th scale. Kit no. 05543. The USS Maryland BB-46, 1941 in 1/700th scale. Kit no. 05769. There are 2 identical Light gray Letter C parts trees. They each hold the skis, their support arms and small fittings. Four parts per tree are called out as being excess and not needed to complete the kit. (12 parts per tree). There are 2 identical light gray letter D parts trees. Each holds ski fittings. There are 8 parts called out as being excess on one of these trees. (17 parts per tree). Light gray letter E parts tree holds: the propeller guard rails, doors, dash board, steering wheel, head light etc. (24 parts). Trees letter D, E and F have sheet foam wrapped around them to protect the parts from breakage . Good work Trumpeter! Next is the single light gray chassis hull tub part. The die-cut clear sheet holds 6 windows. A length of brass wire is provided to fabricate brake lines out of. The instructions consist of a 8 page staple-bound booklet in 8 ½” x 11” page format. Page 1 begins with a black and white profile illustration of the NKL-16. This is followed by READ BEFORE ASSEMBLY instructions in English and Chinese. International assembly symbol explanations are next, followed by decal application instructions in English and Chinese. 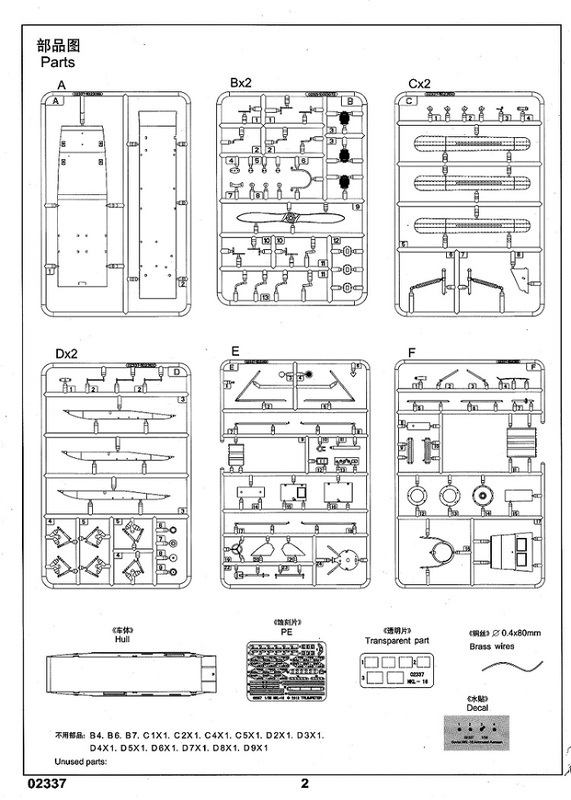 Pages 3 to 8 give a total of 7 assembly step drawings. This is the 3rd kit of a aerosan variant that Trumpeter has released on the market. The others being a NKL-26 (kit no. 02321) and a RF-8/GAZ-98 (kit no. 02322) which I have currently built. This is a nice kit, although a little expensive. It does not include any crew figures, dispite the 2 guys shown on the box art. The interior detail could be better, with some foot pedals and control levers. I recommend this kit to modelers that have moderate building skills. I purchased my kit at my local hobby shop.